Although the Jewish presence in New Orleans dates to the earliest years of 18th century settlement, formal communal organizations did not develop until many years later. Conforming to the city’s generally lax religious atmosphere, the first Jewish residents intermarried freely and assimilated comfortably into New Orleans gentile society. In 1827 Jacob De Silva Solis founded the city’s first Jewish congregation, which adopted the name of Shangarai Chasset (Gates of Mercy). The congregation followed the Sephardic Ritual, as many of the original members were of Spanish and Portuguese descent. These early congregants encountered difficulty attracting membership from among their assimilated brethren, and the congregation struggled to hold regulars services and hire reliable rabbis. To cater to their intermarried members, the congregation allowed non-Jewish spouses to be buried in their cemetery, and allowed children of non-Jewish mothers to be counted as members. By the 1840s increasing numbers of German Jews arrived in the city, breathing new life into the Gates of Mercy congregation. As the German influence grew, Ashkenazi customs and rituals gradually supplanted the earlier Sephardic traditions. These new arrivals also influenced the congregation’s by-laws. As membership increased, congregants made fewer concessions to assimilated members, and the congregation barred intermarried men from membership in 1841. In these years the congregation did not own a synagogue, but rented a series of spaces, the last of which was a large facility on Rampart Street between Conti and St. Louis. By the late 1840s, Gates of Mercy founding Sephardi members grew dissatisfied with the increasing German influence in their congregation, and decided to establish their own congregation in accordance with their Sephardic customs. They named their new congregation Nefutzoth Yehudah (Dispersed of Judah). According to some accounts, this name was chosen in order to attract the attention and largess of Judah Touro, the prominent New Orleans businessman and philanthropist. Gates of MercyThe 1850s saw the establishment of the city’s first permanent synagogues. In 1850, Touro bestowed Dispersed of Judah with a place of worship, the former Christ Church at the corner of Canal and Bourbon Streets. Six years later, the congregation built a larger synagogue further uptown on Carondelet Street. The same year that Dispersed of Judah moved into the former Christ Church, members of Gates of Mercy began construction of their own synagogue on Rampart Street. The dedication in 1851 year was attended by many Christian residents and a number of Protestant ministers. A few miles upriver, the settlement of Lafayette City began to attract increasing numbers of more recent German arrivals. While the bustling Port of New Orleans handled all the international trade, Lafayette City (later incorporated into New Orleans as the Garden District) served as a staging point for the armada of steamboats and rafts that plied the domestic waterways. In general, Lafayette City tended to attract the more recent Jewish immigrants, less financially established than their downtown predecessors. Nearly all engaged in business, either as modest peddlers or as the owner of dry goods or mercantile establishments. In 1849, these residents organized the Jewish Benevolent Society of Lafayette. From this group evolved congregational services which were formalized the following year with the establishment of Congregation Shaare Tefillah (Gates of Prayer). Members initially hoped their that the more established Gates of Mercy would adopt Shaare Tefillah as a branch congregation, but the downtown Jews showed little interest in funding the project. Undaunted, the Lafayette City Jews proceeded to raise funds on their own. After meeting in a number of rented spaces, members succeeded in purchasing a building at the corner of Fulton Street and St. Mary. In 1859, the congregation purchased a lot at the corner of Jackson Avenue and Chippewa, but construction was delayed until the conclusion of the Civil War. Members of Gates of Prayer finally dedicated their new synagogue, (soon referred to as “The Jackson Avenue Shul”) on April 5, 1867, an event which included members from city’s other Jewish congregations as well as from the gentile community. During this period, all three congregations generally adhered to traditional Orthodox practice, but innovations gradually modernized the services. The dedication of Gates of Mercy in 1851 featured an organ and a choir, although services still followed Orthodox ritual. Many congregants drifted away from strict adherence to laws of kashruth and the Sabbath. In 1861, Gates of Mercy hired Dr. Bernard Illowy to serve as rabbi, and his unyielding demands for strict ritual observance only highlighted the drift of many congregants from traditional practice. After a stormy four year tenure in which Illowy managed to alienate and anger a large proportion of the city’s Jewish population, he was forced to resign his pulpit. Following his departure, congregants reaffirmed their commitment to modernize, and embarked upon a series of innovations which would ultimately find a formal institutional sanction through the nascent Reform movement. Traditional elements still persisted among Gates of Mercy’s membership through the 1860s. In 1865, the congregation rehired Rabbi James Gutheim, a committed reformer who had earlier served Gates of Mercy before moving to Dispersed of Judah. 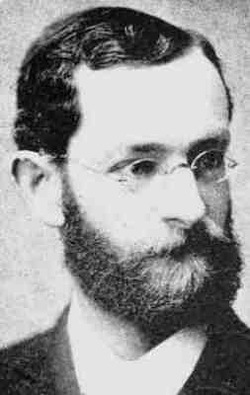 Rabbi Gutheim relaxed many of the stringencies instituted by Illowy. Gutheim oversaw the installation of an organ and the establishment of confirmation classes. His innovations pleased many Reform-minded members, but following Gutheim’s departure for New York in 1868, members with traditional sympathies attempted to roll back many of his changes. The disagreement led a small group of reformers to begin laying the groundwork for the city’s first officially Reform congregation. On July 3, 1870, 37 people met at the office of clothier S.A. Seeskind and decided to establish a new congregation based on Reform principles. Later that year, a total of 109 founding members ratified the constitution of the new congregation, which would be named Temple Sinai. The action drew immediate interest from many New Orleans Jews, and the congregation had little trouble raising funds for a large and impressive temple completed in 1872. The building, on Carondelet Street near Tivoli Circle, featured ornate stained glass windows, an elegant Romanesque design, and two towers reaching a height of 115 feet. Citizens of every faith attended the dedication, and after the solemn ceremony attendants celebrated with a large festive ball. The enthusiasm and success that accompanied Temple Sinai’s founding compounded the challenges facing Gates of Mercy and Dispersed of Judah. Temple Sinai congregants succeeded in bringing Rabbi Gutheim back to New Orleans to serve as rabbi. The congregation grew rapidly, and began to attract members from the two older congregations. Although Gates of Mercy still retained approximately 250 members in the 1870s, the majority of the most prominent civic and business leaders left for Temple Sinai. Financial losses incurred during the Civil War and the depression of the 1870’s brought financial ruin to many members of Gates of Mercy and Dispersed of Judah at a time when the congregations needed as much membership support as possible. A Yellow Fever epidemic in 1878 also took a heavy toll on the Jewish community. In that same year, members of the city’s two oldest congregations began negotiations to reunite and pool their resources. Gates of Mercy sold the Rampart Street synagogue, and moved into Dispersed of Judah’s synagogue further uptown on Carondelet. The official name adopted by the combined congregations was Gates of Mercy of the Dispersed of Judah, but members soon adopted the simpler name of Touro Synagogue. Rabbi Isaac Leucht of Gates of Mercy assumed leadership of the merged congregation. At first, Touro adhered to many of the traditional rituals inherited from Gates of Mercy. By the late 1880s, younger members, often second generation German Jews, began to agitate for less restrictive practices. A general desire to remain competitive with the successful Temple Sinai spurred the reformers’ momentum, although they advanced cautiously to avoid angering members with more traditional leanings. In the 1870s, before the merger, Gates of Mercy had joined the Union of American Hebrew Congregations, but following the UAHC’s adoption of the extremely Reform Pittsburgh Platform in 1885, the Touro Board of Trustees voted to resign from the organization. Despite the careful avoidance of adopting any positions that might offend traditional members, the majority of Touro members gradually drifted toward Reform practices. By the late 1880s, many congregants prayed without head coverings, the rabbi officiated without prayer shawls, and very few members attended services on the second day of festivals. In 1891, the congregation voted to formally discontinue services on the second day of holidays, and allow worship without head coverings and prayer shawls. In 1893, the congregation voted to rejoin the UAHC and soon after began using the Reform movement’s Union Prayer Book. During the closing decades of the 1800s, congregation Gates of Prayer also struggled with the issue of religious observance. Until 1884, all rituals and official Gates of Prayer meetings were conducted in German. The gradual transition to English mirrored the relaxation of strict ritual observances, and by the end of the century the congregation conducted services in English and identified with the Reform movement. In 1904, under the leadership of Hebrew Union College graduate Rabbi Moise Bergman, the congregation joined the UAHC. The twentieth century brought new challenges and opportunities to New Orleans’ three Reform congregations. Burgeoning membership rolls and increased financial security afforded congregants a degree of confidence, encouraging them to assume a more visible role in the New Orleans community. During this period, congregational rabbis ventured beyond their pulpits to serve as civic leaders and to engage in a wide variety of public concerns. Max Heller, beloved rabbi of Temple Sinai from 1887 to 1929, embodied the new public role of the American rabbi. Heller grew up in a traditional Jewish family in Prague that was descended on both sides from distinguished rabbinical families. Although Heller came of age in the progressive, open minded milieu of late-19th century Prague, his family also fostered in him a profound respect for his faith and traditional practices. These dual influences would situate Heller in a unique position upon his relocation to America and assumption of the rabbinate at Temple Sinai. The period of Heller’s tenure at Temple Sinai saw the emergence of numerous new challenges to the Reform movement and to American Jews of every affiliation. A rise in nativism and anti-Semitism undermined the close personal and professional bonds between members of the New Orleans Jewish community and their gentile counterparts. Immigration from Eastern Europe also strained relationships within the Jewish community. The increasing numbers of Jewish immigrants from Eastern Europe – often unaccustomed to American cultural mores – did not always receive an enthusiastic welcome from their more established brethren, in New Orleans and other American cities. The rise of Zionism also spurred great controversy within the Reform movement. Many members found themselves torn between their desire to support their fellow Jews and their assertion that an American Jewish identity is first and foremost American and bears no ties to Jewish nationalism. Despite these tensions, Rabbi Heller never wavered from his deeply held commitments to justice and charity. He advocated passionately for increased assistance and a more welcoming stance towards immigrants from Eastern Europe. His sympathies for traditional Judaism spurred his commitment to help these new arrivals. He viewed them as more than merely a charity case, but as a way to invigorate what he perceived as an increasingly sterile and stripped-down religion practiced by many Reform Jews. Heller also assumed the controversial role of an early Reform champion of Zionism. At a time when may Reform leaders disavowed the movement and declared “America is our Zion,” Heller vocally supported the cause and strove to reconcile the seemingly incompatible precepts of Reform Judaism and Zionism. In the greater New Orleans community, Rabbi Heller often adopted controversial stances in defense of social causes. He participated in civic affairs, serving as Vice President of the Board of Education, and ultimately was appointed to the State Board of Education. He joined the Young Men’s Democratic Association to oppose the Louisiana Lottery, a private organization that maintained powerful control over much of the state’s economic and political life. Heller served as president of the Anti-Lottery League, and successfully prevented the renewal of the Lottery’s charter. Although his congregants did not always agree with his vocal positions, the membership continued to grow through his tenure, surpassing 350 members by 1905. Other Reform rabbis played important roles in the larger community. 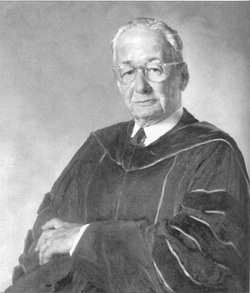 Emil Leipziger, who led Touro Synagogue for 34 years, helped to found the Community Chest and was awarded “The Loving Cup” by the local newspaper for his civic contributions. The early decades of the 20th century saw continued growth for the city’s three reform congregations. 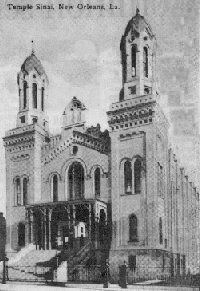 In January of 1909, Touro Synagogue dedicated an impressive new building further uptown, at 4238 St. Charles St. The congregation still uses this building today. Following World War I, President Samuel Jacobs of Congregation Gates of Prayer helped lead a fundraising campaign, and on May 14, 1920 the congregation dedicated a new synagogue on Napoleon Avenue. Five years later, the growing congregation built the Weil Education and Social Center, and established a temple sisterhood. At Temple Sinai’s 50th Anniversary Jubilee Celebration in 1922, Rabbi Heller proposed building a larger synagogue. In 1926, the congregation purchased property at the corner of St. Charles Avenue and Calhoun, and in 1928 completed construction of “a massive structure of exceeding beauty,” which included space for offices and the growing Sunday School. In the years following World War II, the Reform congregations of New Orleans supported the growing Civil Rights movement, with their rabbis often publicly leading the city in the fight for racial equality. Rabbi Julian Feibelman of Temple Sinai, who served the congregation from 1936 to 1967, preserved Rabbi Heller’s legacy of taking bold public positions on issues facing the New Orleans community. In 1947, the Inter-Racial Committee of New Orleans sought a venue to host a speech by Dr. Ralph Bunche, a former UN mediator to Palestine. As a stipulation, the IRC insisted on the right to host an integrated audience. When every large venue in the city declined to host an integrated event of this size, Rabbi Feibelman stepped forward and offered the use of Temple Sinai. As Feibelman explained at the time, “it would have been an unspeakable outrage to deny Dr. Bunche a platform and an opportunity to speak in this community.” The event was a rousing success and drew an integrated audience of over 2,000 people. Due to Feibelman’s bravery, Temple Sinai can still claim today to have hosted the first un-segregated meeting of its size ever held in New Orleans. Feibelman was not a solitary voice, and during the 1950s, Rabbi Leo Bergman of Touro Congregation also publicly and passionately advocated for the cause of Civil Rights. The demographic shifts that affected many southern towns in the second half of the 20th century did not have a similar effect in New Orleans. In many other Southern towns, synagogue buildings eventually migrated to the suburbs along with the majority of the congregants. In New Orleans, however, many of the synagogues remained at their original sites within the city limits. Both Temple Sinai and Touro still occupy their original structures built in the early 1900s. The original charters of these two congregations stipulated that they must remain located within Orleans Parish, which discouraged any relocation to the suburbs. Temple Sinai has over 700 member families, and has been led by Rabbi Ed Cohn since 1987. Touro Synagogue has over 500 member families and since 2008 has been led by Rabbi Alexis Berk. Gates of Prayer is the one old New Orleans congregation that followed its members out to the suburbs. In 1975, Gates of Prayer moved to a new site in Metairie on West Esplanade Avenue, to serve the suburb’s growing Jewish population. With almost 500 members, Gates of Prayer has been served by Rabbi Robert Loewy since 1984. In 1996, Jews who lived on the north shore of Lake Ponchartrain founded the Northshore Congregation. In 2002, they purchased an old church in Mandeville for use as their first synagogue. Since its founding, the Reform Northshore Congregation has grown rapidly. It currently has 120 members and a full-time rabbi. Although there have been rivalries over the years between the Reform congregations of the city, they have often cooperated. For years, Temple Sinai, Touro, and Gates of Prayer have held joint Shabbat services during the summer, with each synagogue taking turns at hosting worshippers. Since Hurricane Katrina, the congregations have pulled together and worked toward rebuilding the city and its Jewish community.